NEW YORK, 9 November (Office for Disarmament Affairs) — The United Nations Office for Disarmament Affairs, in cooperation with its Regional Centre for Peace and Disarmament in Asia and the Pacific and the Geneva International Centre for Humanitarian Demining, organized two sub-regional training courses to engage States of Central, South and South‑East Asia on the subject of conventional ammunition management, in particular the International Ammunition Technical Guidelines and the UN SaferGuard Programme. The training was held from 11 to 16 November in Kathmandu, Nepal. Inadequately managed ammunition stockpiles pose the dual dangers of unintended explosions and diversion to illicit markets. 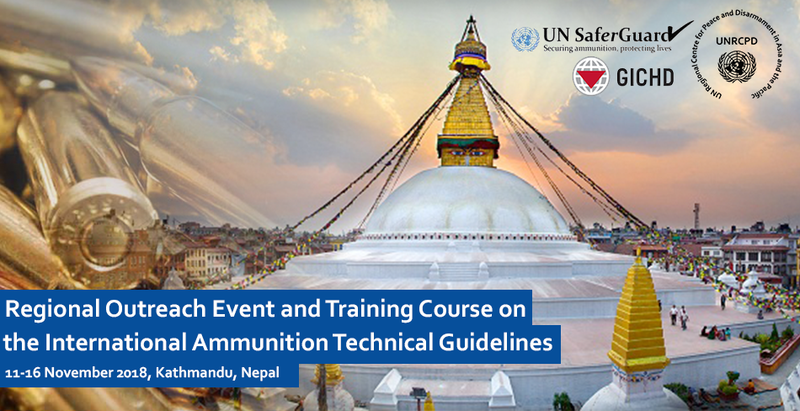 In response to these challenges, the United Nations developed the International Ammunition Technical Guidelines in 2011, to provide practical, step‑by‑step guidance for all stakeholders wishing to improve the safety and security of ammunition storage sites. In parallel, the UN SaferGuard Programme was launched as the complementary platform for managing knowledge of conventional ammunition issues within the United Nations. Activities under the UN SaferGuard Programme support realizing the “Saving lives” pillar of the Secretary‑General’s agenda for disarmament — Securing Our Common Future — specifically action 22 on securing excessive and poorly maintained stockpiles. The subregional training aimed to increase awareness of the UN SaferGuard Programme — with a view to supporting national authorities in the safe and secure ammunition management. Furthermore, the training served as a platform to introduce the “UN SaferGuard Validation Process”, with a view to encouraging the participation of technical ammunition experts from Asia and the Pacific in future validation exercises. The UN SaferGuard Validation Process is developing an objective methodology for validating technical expertise in relation to ammunition, in accordance with the International Ammunition Technical Guidelines. The process also seeks to populate a roster of experts for use by the UN SaferGuard Quick Response Mechanism. In support of the validation process, and to define the essential criteria for rostered ammunition experts, participants in the subregional training engaged in a survey of national ammunition management systems. The survey’s findings will support the development of standardized methodology by illustrating differences in educational and training models for managing ammunition. The trainings were made possible with financial support from the Government of Sweden, and they were held under the framework of the “Kathmandu Process”. For further information, please contact Yuriy Kryvonos, Director of the United Nations Regional Centre for Peace and Disarmament in Asia and the Pacific, at email: info@unrcpd.org.